I love how Ence’s imagination works. 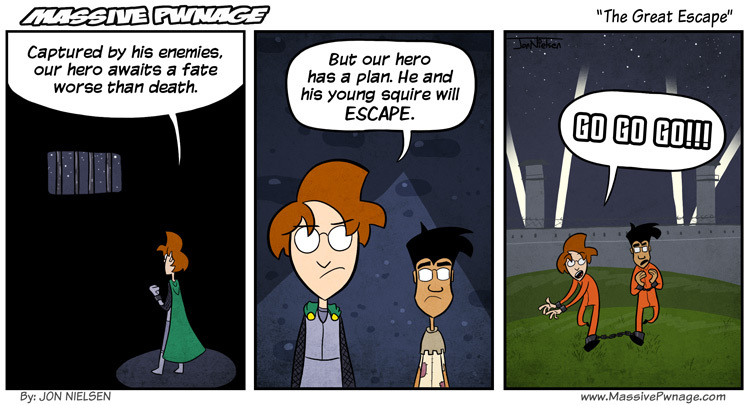 This entry was posted on Wednesday, February 23rd, 2011 at 12:00 am and is filed under Comics. You can follow any responses to this entry through the RSS 2.0 feed. Both comments and pings are currently closed. I’m sure in the next comic we’ll find out why they’re in prison… Or maybe not. maybe someone on the minecraft server has trapped them in an obsidian cell without an pickaxe! did they assault people with nerf guns… again? Locke’s old spychecking habit again, he just forgot Friendly-Fire is always on in the server we call life. Are you implying that Locke has psychosomatic hallucinations? Because spies are a very real threat and they WILL kill you. Im not schizophrenic! The voices tell me Im not!